​Oh my goodness, if you haven’t seen the statistics lately for some of the billfishing crews, you should. It has been nothing short of remarkable, yet again. May I say that we have a sensational world-class fishery here, that we are only just touching the surface of its potential. There have been numerous queries from anglers globally after the big blue was caught on New Years Day. Not that they all want to catch a big one, but they have now seen the statistics of anglers here in Exmouth and want to come from all areas of the globe. There is no doubt in our mind that February going forward will be a busier time in Exmouth with international visitors chasing the great fish we have here for catch and release. A recent visitor to Exmouth was trying to catch ‘anything’ from shore on rod and reel. They were not having much luck and after a few social media requests got in to some ripper queenfish from Learmonth Jetty. Lures are what we recommend for the best options for queenfish at anytime. I always say that swapping the trebles for a single in-line barbless hook is also the best for both the fish and an easy release. Of course, if you wish to keep a queenfish to eat, we also recommend they are best eaten fresh and if you can steep it in vinegar and herbs of coriander, with sweet soy and ginger, then leave it for 12 hours, you will never let the first one go again! It is divine to eat that way. Tre Carson is a young man who was introduced to fishing as a toddler by his Dad Che many moons ago. Tre is now following in his father’s footsteps and has come to Exmouth for a month fishing with his mates. The boys have been out in the dingy they towed up and got in to all sorts including bludger trevally, coral trout and massive queenfish in the gulf. 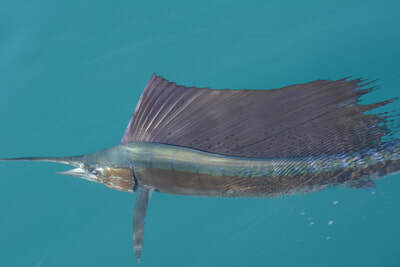 They jigged vibes mainly and have seen several sailfish in the shallow waters only a few hundred meters from the shore. 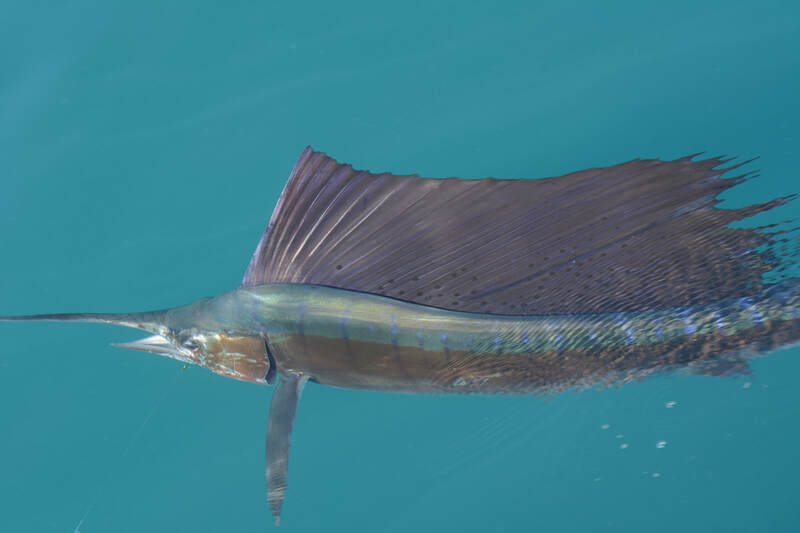 In fact, we have had many sightings of sailfish in the gulf this last week including one that took to a popper in just 6 meters of water near Gales Bay. Tre and his mates tried for blue bone inside the reef around the west side and managed to get a cracker using crab bait. The fish was fileted, wings removed and the head was used to make a massive seafood chowder that tasted sensational. Kate Sewel and family, along with a few mates have been up for a fishing trip this week with Kate and Ian’s young son Zac. The boys headed out in the boat one day for a fish and Kate decided to go to Bundegi for a shore fish. Kate got in to the massive whiting on her own and showed-up the boys. The group had an awesome stay that included watching an amazing lightning storm and seeing rain, something that I said they were privileged to see because not many people see rain in Exmouth. They also experienced the turtle hatching on the west side and will be back again next year. Don’t forget that the annual awards night is on this weekend for EGFC. Come down and see what was caught for the fishing year. Please RSVP to info@egfc.com.au by Wednesday to secure your table for this great night. Some of the many winners at the Annual Awards Night. ​Dave Holbery was in Exmouth with his mate Craig from Perth for a week of fishing and managed to get out on friends’ Barry and Lexi Taylor’s boat to target billfish. They missed out (by being here) on a tournament down south that had 35 boats in it, but they certainly did not miss out! The fleet down south managed to raise 3-2-0 billfish for the day, while the one crew here in just four hours went 6-3-2. Dave managed to get his first marlin and is still raving about it, not to mention planning to retire here one day soon. These type of statistics along with so many others lately have been unbelievably fantastic. Captain Eddy Lawler has again achieved an amazing result with a double grand slam marlin in one day, which we believe may never have been done in the world. The upcoming GAMEX 50th fishing tournament is gearing up to be another big one with anglers already entered from WA, QLD, VIC, NZ and Canada. There is still time to get your entry in before the penalties apply on March 1st, so if you are fishing and have not entered, please enter asap. Garfish have been targeted by several anglers lately to use for bait. Gardie fishing can be great fun with the kids from the shoreline along the gulf beaches. Using small long shank hooks with prawn for bait and a float is a great way to get these awesome bait fish that mingle on the surface in our clear waters. There’s a few varied types in this area, some long-billed and some short-billed, but they are all good. A throw net is another way to collect fresh bait, although it can be tricky if the gardies are scattered. Remember you do need a netting license if you intend on using a cast net. Queenfish have continued to show up along the shoreline in the gulf and so have various trevally species. These predatory fish can roam the whole shoreline, as well as venture up the canals in the marina. On Friday afternoon young anglers Jackson and Maddison Venrooy tried their luck in the marina with prawn, mulie and squid for bait. The kids got straight in to the bream, but also managed to get a juvenile giant trevally and queenfish. The turn on the low tide combined with the sunset is a prime time for the fish to bite in the marina and this day it all lined up. 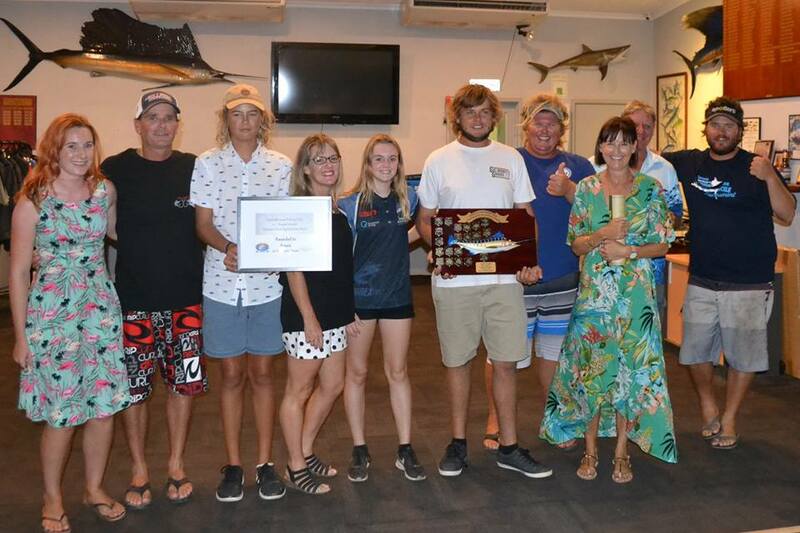 The EGFC Annual Awards night was held on Friday and it was a spectacular event with many local members showing up to be awarded certificates, trophies and prizes for fish caught during the 2017 calendar year. Raquel Roche did an amazing job and with help from various committee members the night was one of the best on the EGFC calendar. If you are keen to fish and want to join the EGFC, memberships are open now and you could learn more, help others, fish in events and simply join in the fun of fishing in Exmouth. Congratulations to all the winners and a massive thank you to all the Sponsors of the evening. What an amazing weekend of weather and good fishing we just had. It was absolutely perfect with calm conditions, light winds when it was too hot, clear waters and hungry fish. I just love the northwest and when it turns it on for locals to enjoy a few days off, it is even better. Many crews that are fishing GAMEX are heading out for practise days prior to the event. Youngsters William Roche and Jake Fitzgerald are fishing with a few adults in the comp and headed out for a fish on Saturday to target pelagics. In under three hours they managed to successfully switch a sailfish and marlin, while also getting a few dolphin fish and tuna. Jake’s uncle from the UK was also onboard, who had never caught a game fish. He managed to get all these species and was absolutely blown away by the great fishery we have in Exmouth. The next day the crew decided to target other species in the gulf and got in to some cobia, tuna, trevally and mangrove jack on light line. William is pictured this week with the jack and it was yet again a great day on the water. Whiting have been quite abundant in the shallows of Exmouth gulf this last week, with reports of them coming in from people driving the shoreline in search of a place to set up for a fish. Large schools of them can be seen clearly when using polarised sunglasses and they tend to come close to shore to feed on the high tide. Anglers have been catching them on fly, small poppers and baits of prawn. These fish are super tasty and make sure that if you want to keep some, you have a good esky with ice to keep them in optimal condition for consumption. I also like to remind people when fishing the gulf like this to make sure you have a squid jig in your tackle box because they often show up when targeting whiting along the coast and you can’t really catch squid on anything but a squid jig. What would be your dream fish? If you could wish to catch anything in the world, chances are most species are available here. People travel from all over the world to here, to catch their dream fish, and I always comment on how lucky we are here to have such abundance and variety of species. I personally prefer to see others enjoy fishing and get much more pleasure watching someone catch their first billfish than me catching a fish. I do believe the swordfishing in Exmouth is yet to be opened up and I would be willing to bet that in the next five years we will see a great increase in the amount of broadbill caught, tagged and encountered. 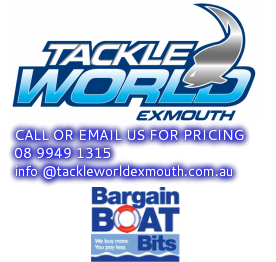 The Australian International Billfish Tournament is being hosted once again by the Exmouth Game Fishing Club. If you’re interested in fishing this 3day tag and release event, please get your entries in asap as the event starts with the briefing on Monday March 12th, fishing is Tuesday, Wednesday, Thursday, with the presentation luncheon on Friday the 16th. All details can be found vi www.egfc.com.au in the tournaments section. This is event is right before GAMEX which starts with the Rig and Gig night on Friday the 16th. This night is where some of the world’s top skippers will be demonstrating some rigging techniques for anglers in a casual social evening. You could learn how to rig up for swordfish, marlin, sport fish, reef fish and other species on heavy and light tackle. Chloe French with a cobia caught off the west side. ​The sensational weather continues as we head closer to the major fishing tournament of the year: GAMEX. (Fingers crossed?!) The EGFC is due a great weather event and the tides are perfect for an epic week of fishing, with fun, camaraderie and competition. If you are not fishing this event, but would like to, there are several spots available on both charter and recreational vessels. There are already over 50 boats entered for this 50th event, which is awesome for the town of Exmouth. Coral trout have been the main talk of anglers this week that have been fishing in the gulf, with several reports of good fish in areas close to the ramp. Divers have also commented on how there seems to be quite a lot about. These fish are territorial and if you do take one from an area, another younger fish will more than likely move in. Coral trout can be difficult to actually specifically target and catch. Drifting areas while casting soft plastics is a good method to catch these delicious fish and please remember to use the whole fish including the wings and frame, as it is one of the tastiest fish in the ocean. The crabs have been quiet in the gulf, along with the prawns over the last while, however we are hoping that coming in to the cooler months it will improve. 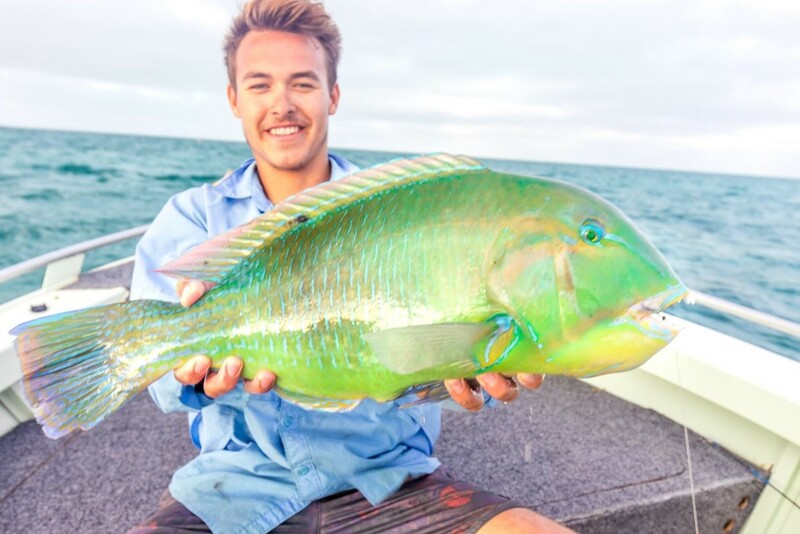 The Exmouth Gulf has some amazing fishing and we always like to remind people that it constantly changes too and can be shallow and difficult to navigate. You don’t want to get stuck on a mud flat or run in to a bombie in shallow water in murky water. The fish encountered in this area can be strange at times, like massive tuna or sailfish right up in the shallows at the lower end of the gulf. Other times you can find schools of big trevally and queenfish. Leaping bonito and various baitfish can be thick too. You can encounter dugongs, whales, mantarays and even whalesharks. In all, it is a very healthy ecosystem that we are lucky to have in our backyard that needs to be recognised, appreciated and respected by us all so we can continue to use it in the future. Recreational anglers are constantly reporting whalesharks already, as we head towards the cooler season. Some of the dive operators have started doing tours and charter fishing vessels have also come across these massive creatures. Chloe French was out with Petal Osborne and came across a whaleshark in crystal clear water on a glass-calm day over the long weekend. 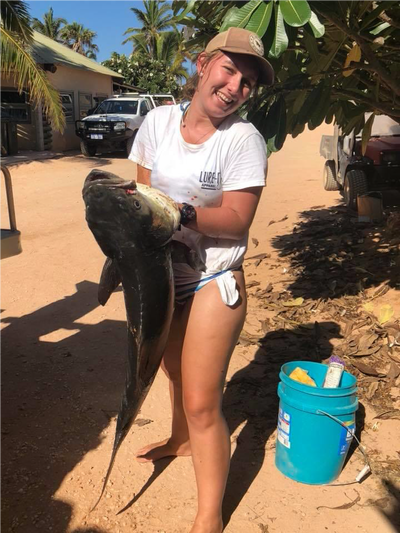 Later in the day Chloe caught a cobia weighing 12.5kg! We have entered Chloe in to our monthly fishing competition to win a voucher to spend in store. Sarah Samuelson with her incredible 10.3kg red! If only we could have the last three weeks of weather repeated for the next three? There was a group of guys up from Perth that stayed in two holiday houses on the canals for a week to have a bucks party for Jeremy Telfa. The guys are avid spearo’s and fisho’s and decided to wait until a bad day of weather was forecast to have the party the night before. However, the weather was so good every day that they couldn’t plan the party! Such an amazing time was had by all the guys though while here, enjoying the prime conditions and awesome fishing in clear waters. They were up nearly everyday at 5am and caught a heap of black marlin and a 180kg blue. They also got in to some big trout, jobfish, bluebone, jacks and red emperor. The town is gearing up for GAMEX, so get yourself down to the Rig and Gig night on Friday March 16th which is the first night of the event and a chance for everyone to catch up for a social casual evening. Listen to some of Australia’s premier skippers as they discuss their techniques and tips. There will be food available on the night and music to party on with afterwards. Saturday is the briefing session from 4pm where over 200 anglers will converge to listen to all the details of the event prior to the six days fishing. Fishing is Sunday-Friday inclusive. Sunday is the Family Fun Day, with Recfishwest running a fishing clinic with games, fishing, prizes and free sausage sizzle for kids. Anyone is welcome and the club will be open for adults for lunch (bookings appreciated). Visitors are welcome to come down each evening to see what has been caught each day. You could learn how to fillet a fish and take home some fish samples, or talk with the marine biologists about their studies. You could grab a meal and drink and chat with friends, or possibly win one of the many raffles each evening. Tuesday night is the dress-up mid-week evening with the theme this year of Team Shirts. Many anglers go to a lot of trouble with their team shirts and it is great to see them all collectively that night. There is a chance to win some amazing prizes on the night and this ticketed event may get sold out, so if you are wanting to attend, get down to the merchandise desk on Sunday to purchase a ticket. Thursday is the Sponsor Appreciation Function from 5-6pm, where the sponsors are invited to attend and enjoy some fresh local produce from the Fresh Fish Shack and Kailis. Friday is the last day of fishing and should be a busy night at the EGFC as the anglers queue to see who has caught what. Then Saturday is the Presentation evening with tunes to rock on for the night. If you want to help with this event at all as a volunteer, please call coordinator Scott Owens on 0487 409 355. The long weekend couldn't have turned on the weather any better according to Sarah Samuelson, who had a day organised for bottom bouncing. She and her hubby and friends headed off to their usual secret spots with Sarah only keeping one decent fish until around 4pm. Drifting the last spot of the day proved to be worth it, with a cracking red emperor that showed up the boys onboard. High fives were all around with looks of shock and disbelief as the 10.3kg red was hauled on to the deck. It ticked off a fish on her bucket list and ended up being remembered as an epic day of fishing.